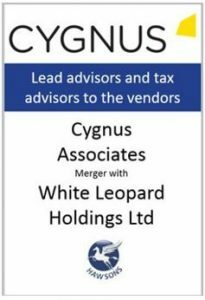 The Hawsons’ specialist tax and business advice teams have worked closely with the shareholders of Cygnus Associates on the merger of their company. Cygnus Associates were founded 25 years ago and are one of Milton Keynes’ largest design, branding and digital agencies. The Milton Keynes’ company is a highly successful, family-run business while White Leopard Holdings are a leading company in Milton Keynes’ who specialise in creative design such as websites, apps and branding.